Facebook has million of users, which means millions of profiles containing potentially sensitive information. Many people don’t think twice when listing their phone number, adding strangers, or posting about going out of town on their Facebook. However, there are many precautions one can and should take on Facebook to ensure their own safety and the safety of their personal information. 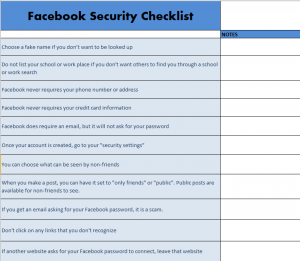 The Facebook Security Checklist Template is a list of possible security measures one can take to ensure the safety of their information and how to spot scams and possible dangers on Facebook. Choosing a fake name is a good way to prevent employers or others from finding your account, however it may stop people you actually do know from finding your Facebook. If you want to only add people and don’t want employers or others finding you, choose a fake name. For example, if your name is “Susanne Marie Jones” choose “Suzie Marie” or something similar. Facebook doesn’t require your phone number, address, credit card information, or passwords to any other accounts. It does need a valid email address to verify, but that’s it. Go to your security settings under the security section of Facebook’s settings and choose how much of your profile you want others (non-friends) to be able to see. You can make your profile entirely private, hiding everything, or choose to let people see your work place or other information listed. Remember: Having something as public means that even those without a Facebook account can view that information. Never share your phone number, address, passwords, or other sensitive information on Facebook unless done so through private messaging with a trusted friend. You can delete the message from your account after the other person has received it, in case anyone ever enters your account. Make your posts visible to only friends if you tend to post about personal things you don’t want your employer or strangers to see. You can set your posts to be viewed by just friends, or only groups of friends (IE a group of close friends, your work friends, etc). To read the full list of security measures, download the Facebook Security Checklist.